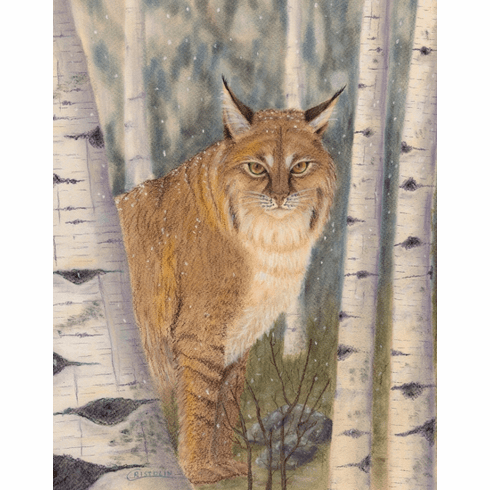 "Bobcat in Birches" is an original pastel painting by the nature artist Cristolin. The painting features a bobcat gazing from behind silvery birches on a slightly misty, snowy day. This would be ideal for a cabin, or anywhere you want to bring in a woodsy feel. This painting works well alone, or in combination with "Gray Fox on Snowy Evening". Each print is signed and numbered on the back by the artist. They are printed on high quality, artist-grade, archival paper using pigment-based inks and shipped in a tube. Also available as 5 x 7 folded greeting cards (blank inside) in boxes of 10. Mix and match with other works by Cristolin to create your custom greeting card selection. Or, let Cristolin mix them up for you! Usually ships within a week. Cristolin's art is inspired by the magnificent landscapes and wildlife she has encountered while hiking thousands of miles in remote and wild America. In years of study and wilderness travel, she has come to appreciate that the beauty of wildlife and wild lands lies not only in their esthetic appeal, but in their profound importance to sustaining life -- and spirit. She wishes everyone the opportunity to find joy in the beauty of nature, wherever they may be. PLEASE NOTE: Cristolin has agreed to sign each piece and add a short note (her choice) to the named person(s) of your choice (two first names is the maximum), personalizing this as a gift or momento. WHEN YOU CHECKOUT, please use the COMMENT section to indicate the first name of each person Cristolin should address her note to. If you have chosen to mix and match your purchase of 10 notecards, please also use the COMMENT section at CHECKOUT, to note your Cristolin art selections. Maximum selections are 10.